In this companion novel to Anna and the French Kiss, two teens discover that true love may be closer than they think For budding costume designer Lola Nolan, the more outrageous, the outfit - more sparkly, more fun, more wild - the better. But even though Lola's style is outrageous, she's a devoted daughter and friend with some big plans for the future. And everything is pretty perfect (right down to her hot rocker boyfriend) until the dreaded Bell twins move back into the house next door. 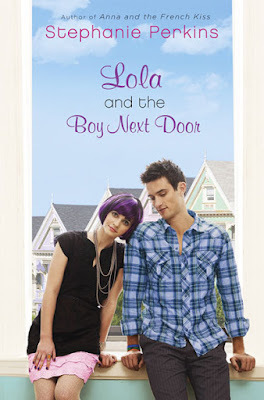 When the family returns and Cricket - a gifted inventor and engineer - steps out from his twin sister's shadow and back into Lola's life, she must finally reconcile a lifetime of feelings for the boy next door. Lola's mom was a homeless drug-addict and gave her up when she was a baby. She gave Lola to her brother and his boyfriend, who raise her as their own child, but Lola's mom still shows up from time to time, usually in bad shape, or in jail, and it's really hard on Lola. Then there was Cricket. The writing on his hands, his pants, his hair, the way he loves to invent things that have no meaning, but mean so much, how much he loves and supports his sister, the way he aches for Lola and what he let slip away. I just love him!! Speaking of tension....this book is FULL OF IT! I'm beginning to think that Stephanie enjoys ripping my heart out and tearing it into pieces, only to put it back better than new. My chest seriously ached for Lola and Cricket to find a way to reconnect. I feel like I could go ON and ON!! Oh, wait, I already have. Ok, if you haven't gotten the point by now, I loved this book. It was funny, and witty, and emotionally gut-wrenching, and fabulous, and sparkly!